Started a Blogger blog recently and willing to rank it better in search results? Your Blogger blog will perform well only if you analyze and properly optimize your blog posts. There are many SEO tools out there to analyze, but one that is free and come in handy is Google webmaster tools. In order to know your Blogger blogs performance in search engine you have to start using Google webmaster tools. Here we will see how to add Blogger blog to Google webmaster tools. Google webmaster tool is a nice handy tool that shows how your blog appears to bots, how it performs and how many times it appeared in search engine. It provides you a detailed report and data on your blogs search traffic, crawl status, index results and much more. It notifies you if there is any problem within your blog that prevents crawlers from accessing your blog pages. By using and understanding all the elements in Google webmaster tools you can make your blog Google friendly. Moreover by submitting your blog sitemap in Google webmaster tools you are making bots to crawl your pages better. Each and every webmaster can submit and must submit their blog to Google webmaster tools. You need to verify your Blogger blog first, before you can access the features in Google webmaster tools. Login to Google webmaster tools with your Blogger account and click add a site. Now add your Blogger blog domain name and click continue. You will now see recommended verification method that is HTML file upload. To upload HTML file you need to have access to hosting server. Only self-hosted blogs can use this method. In alternate method select HTML tag which is the easiest way to verify your Blogger blog to Google webmaster tools. You will now see a Meta tag, just copy it. Now in your Blogger dashboard go to template >> edit HTML and paste the Meta tag just below the <head> tag. Save template when you are done and then head back to Google webmaster tools and click verify and you are done. You can add as many sites you own. Your site is just new and so you will see no data in Google webmaster tools. So after the verification process you have to submit your sitemap to Google webmaster tools. Learn how to create sitemap in Blogger and how to add Blogger sitemap to Google webmaster tools. In order to see data, report and graph just wait for a day after the submission of your Blogger sitemap. Also read: – How to use Google webmaster tools effectively for SEO. 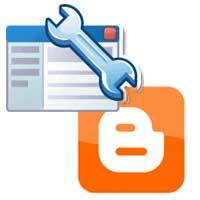 Hope this helped you on how to add Blogger blog to Google webmaster tools. Share and Subscribe to our RSS feeds.